The Met reopens, concert halls are dark. With the subways down, Ariel (Audrey Luna) can ride a chandelier to work! Scene from Act III of Thomas Àdes' The Tempest. Along with the city's electrical grid and subway system, the New York classical music scene is slowly getting back on its feet. The Metropolitan Opera has announced that it will resume operations tonight. It is not the place of this blog to comment on the ironic coincidence that the work to reopen America's biggest opera house is Thomas Àdes' opera The Tempest. The Met resumes business as usual on Friday and Saturday with further performances of Turandot, The Tempest and Le Nozze di Figaro. Opera lovers who've already seen the Àdes opus have a choice tonight. At Lincoln Center's Rose Theater (located in the Time Warner Center at W. 59t St. and Broadway) Teatro Gratticielo will offer a rare performance of La Nave by Italo Montemezzi. This show is postponed from Monday night. Met stays dark as tonight's Turandot nixed. 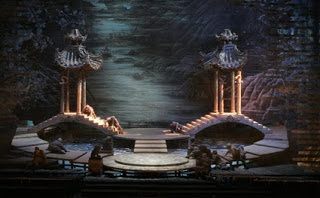 The set for Act III of the Met's Turandot. 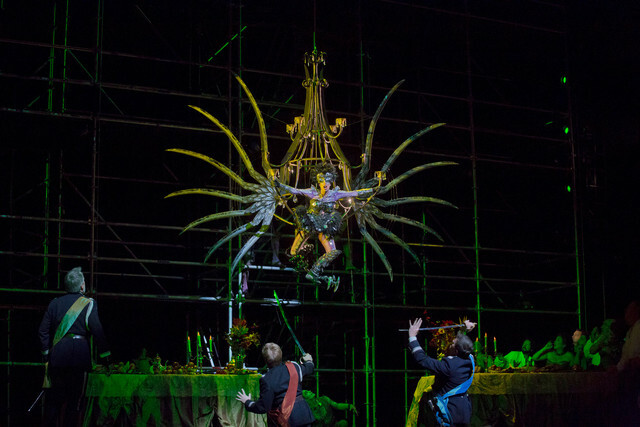 Image © The Metropolitan Opera. The Metropolitan Opera has announced on its website that today's planned performance of Turandot has been cancelled. This news will presumably be a great relief to the Prince of Persia, who gets decapitated midway through the first act. The company's business office is closed today. Full ticket refund and exchange information is available here. The Met has also announced on its website that Thursday's Met Talks event, designed to preview its upcoming new production of Un Ballo in Maschera has been cancelled. In related news, all events at Lincoln Center are cancelled today. Carnegie Hall has announced that they are closed today and tomorrow. For your viewing pleasure, here is a complete Turandot (the Franco Zeffirelli production) filmed at the Met in 1989. This performance stars Placído Domingo, Leona Mitchell and Eva Marton in the title role. Enjoy, and stay safe out there. in Act II of Die Frau ohne Schatten from the 2011 Salzburg Festival. Photo from the Salzburg Festival ©2011 OpusArte. The historic early days of the recording era are at the center of Christof Loy's stripped-down Salzburg production of Die Frau ohne Schatten, the longest and most challenging of Richard Strauss' fifteen operas. Mr. Loy moves the action of this fairy-tale opera to a Vienna recording studio, a replica of the Sofiensaal ballroom which served as a crucible for the modern industry of recording classical music and opera. Rafael Frühbeck de Burgos conducts Mozart and Mahler. On Friday afternoon, the Spanish conductor Rafael Frühbeck de Burgos led the New York Philharmonic in a concert that focused squarely on the orchestra's famous horn section. This was the second concert to feature second program of Mr. Frühbeck's two weeks at Avery Fisher Hall this season, pairing lighter works by Mozart with Mahler's First Symphony. With the Serenata Notturna, the Philharmonic players sounded much more at ease for Mr. Frühbeck then they had in the orchestra's previous Mozart concert this season. The Serenata borrows ideas from baroque music, pitting a small "Salzburg quartet" (two violins, viola and double bass) antiphonally against the rest of the orchestra. Conducting from his customary stool, the 79-year old Mr. Frühbeck brought out the wit and good humor in this three-movement Serenade. Particularly entertaining: the last movement with its abrupt, seemingly random changes of phrase and tempo, its whiplash changes designed to trick the ear, and its virtuoso parts for the Salzburg quartet, whose contrast against the main orchestra is a forerunner of the Act I finale from Don Giovanni. Metropolitan Opera, Carnegie Hall shut doors for Hurricane Sandy. and soprano Mojca Erdmann has been cancelled due to Hurricane Sandy. 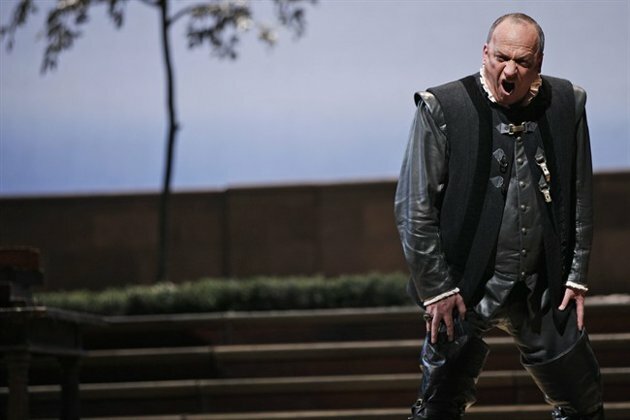 Photo by Marty Sohl © 2012 The Metropolitan Opera. As the 500-mile wide girth of Hurricane Sandy barrels up at the New York metropolitan area, our fair city has shuttered its doors. The subways close at 7pm tonight. Buses stop running at 9pm. And that means that the whirl of the fall season comes to a temporary halt as we get ready to ride out the worst storm of this century--so far. Carnegie Hall has cancelled performances scheduled for tonight and Monday night. 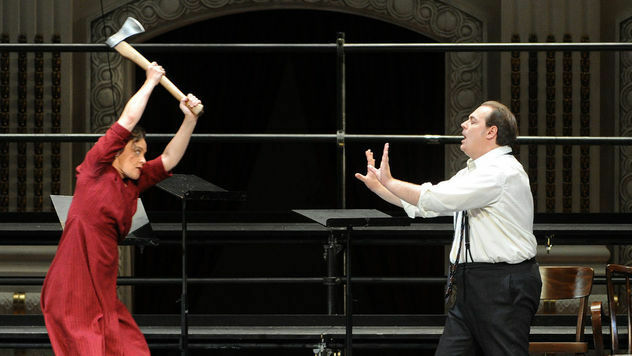 The Metropolitan Opera has also cancelled Monday's performance of Le Nozze di Figaro. Judging from some of the negative reviews that this revival of the company's Jonathan Miller production, this may not necessarily be a bad thing. To tide you over in the next two days, stay tuned to Superconductor: there are reviews coming of the Friday afternoon New York Philharmonic concert, and of last night's Carnegie performance by the Atlanta Symphony Orchestra. Meanwhile, for your Figaro fix, enjoy this complete 2006 performance from the Salzburg Festival conducted by Nikolaus Harnoncourt and featuring an all-star cast. Stay safe. Stay inside. Listen to more opera. That's what we plan to do. That, and write some reviews which will post on Superconductor in the next few days, time, energy and Con Ed permitting. Opera Review: Magic on Mass. Ave.
Charles Dutoit conducts the Boston Symphony Orchestra. "Now children, swish and flick." Charles Dutoit casts a magic spell. Thursday night's Boston Symphony Orchestra concert at Symphony Hall featured a twin bill of 20th century operas by Stravinsky and Ravel. Although very different in sound, each 45-minute opera was dedicated to the exploration of fairy tale worlds and the use of vast orchestral resources to depict magical events. 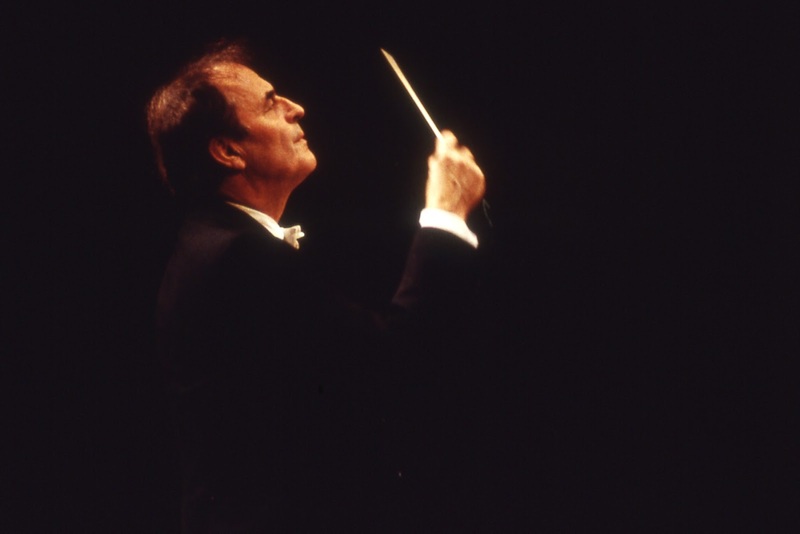 The program was conducted by Charles Dutoit. The Stravinsky work was Le Rossignol, ("The Nightingale") an opera set in that same peculiar European vision of ancient China as Puccini's Turandot. This short three-act opera is based on a story by Hans Christian Andersen, of a Chinese emperor's complicated relationship with a nightingale (Olga Peretyako) whose song has the power to bring tears and ultimately, save the life of the dying Emperor. Le Rossignol had a difficult genesis. In fact, the composer had only just finished the first act when he was commissioned by his friend Sergei Diaghalev to write a ballet for Paris, a work that turned out to be The Firebird. He did not complete the second and third acts until after the premiere of The Rite of Spring. The first act breathes with exoticism and orchestral combinations that are redolent of Stravinsky's teacher Rimsky-Korsakov. The second part features a thunderous Chinese march and strange tonalities permeating the final confrontation with Death. Valery Gergiev conducts Brahms at Lincoln Center. 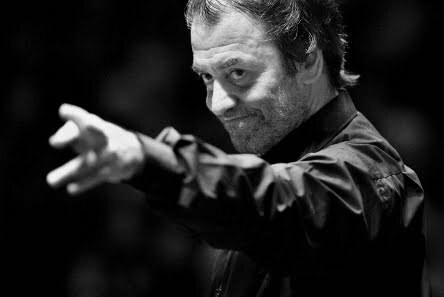 Valery Gergiev led the London Symphony Orchestra on Wednesday night at Avery Fisher Hall. The London Symphony Orchestra are one of England's most prominent, an ensemble known for its lush, vibrant string sound, powerful brass and precise approach to music making. However, on Wednesday night's concert at Avery Fisher Hall, the second of two Lincoln Center performances devoted to the music of Johannes Brahms, those qualities were dimmed by the conducting of current LSO Principal Conductor Valery Gergiev. Balance problems were audible from the opening bars of the Piano Concerto No. 1. 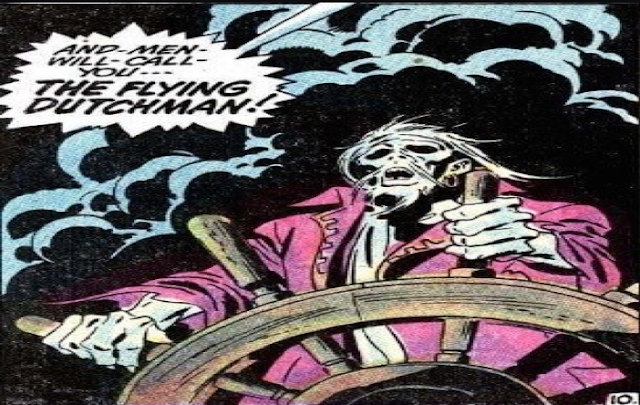 The stern opening theme sounded blurred, the familiar pauses slightly out of "whack." Those issues persisted as the theme moved around the orchestra and developed. At the first repetition of the tutti (just before the entry of the piano soloist) a clamor of many voices replaced Brahms' mighty shout. Pianist Denis Matsuev was better, playing the complicated, and fully integrated solo part with power and precision. The bear-like Siberian pianist proved himself a sensitive, lyric artist as he integrated himself into the orchestral fabric, bursting forth in flourishes of melody and an occasional flash of brilliant prestidigitation. The Met revives Jonathan Miller's production. Ildar Abdrazakov as Figaro in Le Nozze di Figaro. 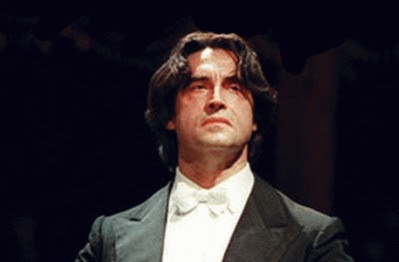 Bass Ildar Abdrazakov sings the title role in Mozart's evergreen comedy. This is the first of two Mozart roles for Mr. Abdrazakov this fall--he's also scheduled to sing Don Giovanni. The Marriage of Figaro was the first of three collaborations between Mozart and Lorenzo da Ponte, comedies that took Europe by storm and predicted the tumult of the French Revolution. Beyond the politics is the brilliant score, packed with hummable tunes and rich, human characters. These performances are conducted by David Robertson, a craftsman who led last year's successful (if brief) revival of Billy Budd. 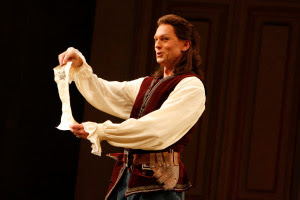 Gerald Finley is the Count Almaviva. Soprano Maija Kovalevska is the Countess, and Mojca Erdmann takes on the role of Susanna, Figaro's intended. Christine Schäfer dons the trousers as Cherubino, the lovestruck page who gets some of the best arias. Le Nozze di Figaro opens Oct. 26. Thomas Adés' The Tempest opens at the Met. Ariel--aerialist: Audrey Luna flies high in The Tempest. In a dreary Metropolitan Opera fall season dominated so far by (dull-to-competent) revivals, the New York premiere of Thomas Adés' opera The Tempest (seen from the very last row of the house on opening night) provides a sorely needed breath of musical and dramatic innovation. Julie Boulianne sings L'enfant et les sortilèges. at Boston's Symphony Hall. Photo © 2012 IMG Artists. It's not easy being a brat. That's certainly the case for Canadian mezzo-soprano Julie Boulianne , who sings the title role in the Boston Symphony Orchestra's two performances of Maurice Ravel's opera L'enfant et les sortiléges ("The Child and the Enchantments") at Symphony Hall this week. The concert marks Ms. Boullaine's debut at Symphony Hall. "It's a little tough," she admits in a telephone interview with Superconductor, speaking of the title role in this opera, an obnoxious brat who destroys his possession and his surroundings only to have them come to life and take umbrage at his behavior. "He's all over the place. "He's so mean to everybody." "It's really written like a child would sing it," she says. "The comments (in the score) are 'child-like' and vocally you feel as if you are a child too. I bring something different to the voice and the musical phrasing--I try to keep it as a younger child would sing it without taking away the beauty of the music." as the eighth music director of the Philadelphia Orchestra. Friday night on Broad Street found the Philadelphia Orchestra playing with renewed energy and purpose in Giuseppe Verdi's Requiem. This was also the first subscription concert at the Kimmel Center in the term of new music director Yannick Nézet-Séguin. 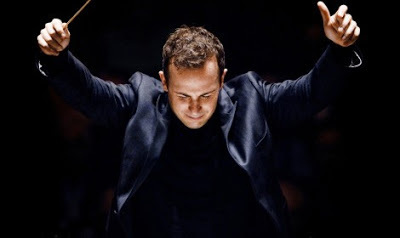 The eighth conductor to hold this post, Mr. Nézet-Séguin has waited in the wings for two years, receiving a buildup in the press and orchestral marketing that would be hard for any conductor to live up to. Happily, Giuseppe Verdi's 1874 Requiem allowed Mr. Nézet-Séguin the opportunity to combine his strengths in symphonic and operatic repertory. This 90-minute work, a setting of the Mass of the Dead by the most important opera composer of the 19th century brings the power and narrative drive of Verdi's operas to liturgical material, making the sacred text an energizing, earthy experience. Working without benefit of a score, Mr. Nézet-Séguin proved to be an adept navigator of this weighty work. He provided clarity and a beauty of texture to the opening statement of Requiem aeternam and the powerful, aria-like Kyrie that followed, with strong contributions from his four soloists: soprano Marina Poplavskaya, mezzo Christine Rice, tenor Rolando Villazón and bass Mikhail Petrenko. 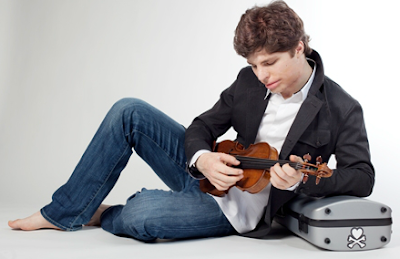 A man and his Stradivarius: Augustin Hadelich. Photo from the artist's website. The Spanish conductor Rafael Frühbeck de Burgos opened a two-week stand at the New York Philharmonic on Thursday night. The program played to this conductor's strengths, exploring two intricately connected works of 19th century French repertory: the Symphonie espagnole by Édouard Lalo and Hector Berlioz' evergreen Symphonie fantastique. Despite its title, Lalo's "symphony" is actually a violin concerto, written for (and premeired by) violinist Pablo de Sarasate in 1875. Lalo's work falls in with the French craze for music with Spanish seasoning, incorporating the solo violin part in five sunny movements that evoke the most picturesque aspects of Iberian life. The solo part was played by the talented Augustin Hadelich, a violinist who overcame serious injuries from a fire in his teenage years to emerge as a brilliant artist. Mr. Hadelich played with a clean, rich tone that soared into the highest registers of the instrument before diving earthward in a series of ever-more-complicated runs. Sensitively accompanied by Mr. Frühbeck, this performance made a good case for works by Lalo to be heard more often. Otello at the Metropolitan Opera. 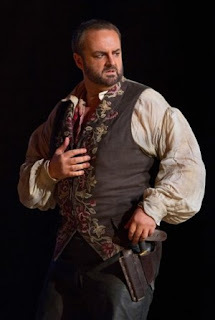 He is nothing if not critical: Falk Struckmann as Iago in the Met's Otello. Photo © 2012 The Metropolitan Opera. The Metropolitan Opera's ambitious slate of Verdi operas continued this month with a revival of Verdi's Otello. The plan: to reunite tenor Johan Botha with soprano Renée Fleming, a pairing that proved potent in 2008. But on Tuesday night, Mr. Botha cancelled due to illness, leaving the challenging title role to Russian tenor August Amonov. 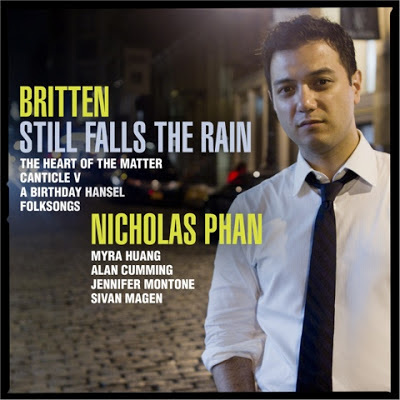 Nicholas Phan Sings Britten at Le Poisson Rouge. Nicholas Phan's new release Still Falls the Rain. Image © 2012 AVIE Records. The Connecticut-born singer Nicholas Phan has come forth as one of the most promising young tenors singing today. On a rain-soaked Monday evening, the singer performed at Le Poisson Rouge, offering songs by Benjamin Britten in a concert that was also streamed live on the website Concert Window. Britten wrote (or in the case of the folk-tunes, arranged) these songs for Pears' remarkable instrument. Mr. Phan brings a different sound quality to the works, a youthful, clear tenor and a pliant, powerful tone that can hit difficult high notes and swoop down into the lower range without a break between registers. That flexibility was on full display as Mr. Phan tackled this challenging material, accompanied by harp, horn and piano. 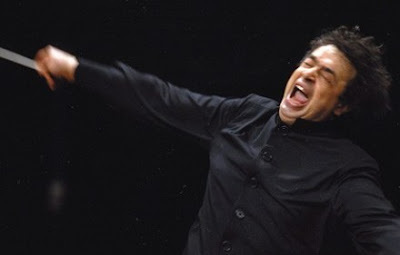 Semyon Bychkov conducts the MET Orchestra at Carnegie Hall. Your mountain guide: conductor Semyon Bychkov led the MET Orchestra at Carnegie Hall. This weekend, the biggest story in the New York classical music scene remained the (impending) return of music director James Levine to conducting duties at the Metropolitan Opera. However, on Sunday afternoon at Carnegie Hall, it was the turn of another conductor to lead the MET Orchestra in the first of its subscription concerts this season. Semyon Bychkov is a name familiar to opera goers and CD collectors, a talented Russian who has never quite seized the imagination of the general public. Currently in the middle of a run of Verdi's Otello at the opera house, Mr. Bychkov chose a sensible program for his first concert outing with the Met players: Richard Wagner's Tannhäuser overture and five Wesendonck Lieder followed by Richard Strauss' awe-inspiring Ein Alpensinfonie. The result was an exceptional outing for both orchestra and conductor, with firm brass, a lush, pliant tone in the strings and a wealth of audible, finely balanced detail coming from the woodwinds. Maybe it was the good news about Mr. Levine. Maybe it was the choice of repertory. Either way this seemed a particularly inspired afternoon for players and conductor, who all seemed somewhat relieved to be out of the orchestra pit. The Met goes back to the...um..."ensorcelled atoll." 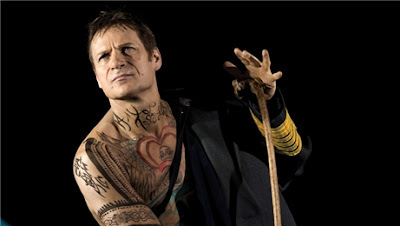 Simon Keenlyside is Prospero, out for revenge--starting with his tattooist. Promotional image for The Tempest. Photo by Anne Deniau © 2012 The Metropolitan Opera. The Met unveils its first ever production of Thomas Ádes' Shakespearean opera, with the composer himself conducting. Simon Keenlyside sings the key role of Prospero, with talented young singers (Isabel Leonard, Iestyn Davies, Audrey Elizabeth Luna) filling out the cast. The Tempest marks the return of Robert Lepage to the Met. The French-Canadian director may still be smarting over the critical backlash received by his staging of Wagner's Ring. 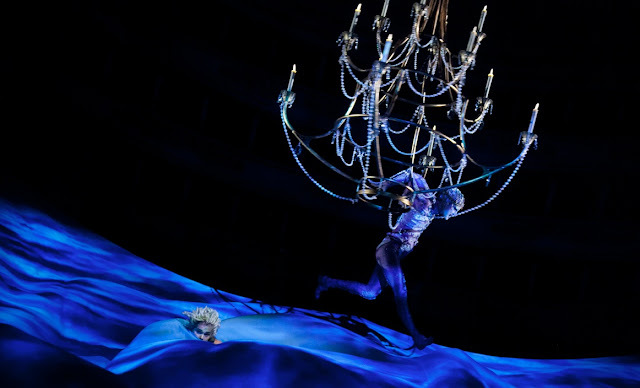 According to the Met website, this staging "recreates the interior of 18th-century La Scala, including the hidden workings underneath the stage, where Prospero, the banished Duke of Milan, practices his otherworldly arts." The Tempest will have its New York premiere on Oct. 23. Met music director to conduct in May. Three operas to follow. He's back! 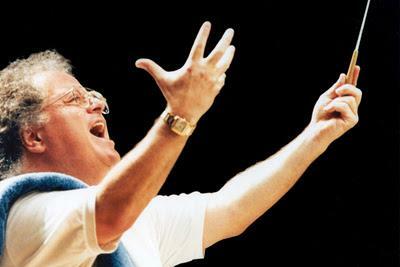 James Levine is scheduled to conduct the MET Orchestra at Carnegie Hall in May, and at the Met in 2013. The Metropolitan Opera chose 7:30 on a Thursday night, on the same night as the 2012 Vice-Presidential Debate to tell the world that music director James Levine is slotted make a May 19th return to conducting for North America's most prestigious opera company. "I’m feeling better with each passing day and look forward to returning to the company I love so much" Mr. Levine said in the official release. "It has been a long healing process, but with a team of excellent doctors and the unwavering support of my friends and colleagues, I’m looking forward more than I can say to getting back to work." The news was first revealed to Superconductor in a Washington Post article by critic and correspondent Anne Midgette. In an official statement, Met general manager Peter Gelb said: “Jim’s return to conducting is the welcome news that our company has long been waiting for." Alan Gilbert advocates for the concertos of the Danish composer. An advocate for Nielsen: conductor Alan Gilbert. on Nielsen’s concertos: specifically the 1926 Concerto for Flute (featuring soloist Robert Langevin) and the earlier Concerto for Violin with soloist Nikolaj Znaider. Read the full article by Paul J. Pelkonen, exclusively on The Classical Review! The Met revives Il Trovatore. in the Met's revival of Il Trovatore. This season's revival of Verdi's Il Trovatore (seen Monday, October 8) is the first of seven Verdi productions at the Met this year, calculated around the celebration of Verdi's 200th birthday. A small detail (like the fact that Verdi turns 199 today) didn't stop the opera company from using the (2013) bicentennial as this year's marketing hook. Equally, not having a tenor up to the formidable task of Manrico didn't stop the show from going forward. Gwyn Hughes Jones is a Welsh singer of some experience, a tenor in the spinto mold that is usually ideal for this type of Verdi part. But on Monday, Mr. Jones offered a bright, slightly nasal timbre that made Manrico an unwelcome presence for the first half of the opera. His unpleasant tone made the character--already something of a cardboard hero--difficult and unsympathetic. He fared better in Acts III and IV, singing the sometimes inaccessible high Cs at the end of Di quella pirra and merging smoothly into the ensembles that bring the last act to its violent climax. The tenor's shortcomings were offset by by Carmen Giannattasio in the role of Leonora. This was her second appearance on the Met stage, and she brought grace and bel canto style to the character. Her sweet tone caressed the vocal line of "Tacea la notte" and she proved equally adept in the opera's fast cabalettas. Most impressive: the Act IV suicide monlogue, where Leonora resolves to marry the evil Count di Luna (Franco Vassallo) but not before drinking poison hidden in a ring. The CSO concludes its three-night Carnegie Hall stand. Last night was the final concert for Riccardo Muti and the Chicago Symphony Orchestra's at Carnegie Hall this season. It offered New Yorkers a chance to hear a program that was successful in Chicago: an unconventional triptych of works by Dvorak, Respighi and the lesser-known pianist-composer Giuseppe Martucci. The concert opened with Dvořák's Fifth Symphony, the work that marks the start of the composer's mature period. (Prior to the publication of a new edition of the Czech composer's symphonies in the 1950s, this piece was widely known as Symphony No. 1.) It remains a marvelous, if under-performed example of the composer's style. Mr. Muti led a bold, robust account of the score, with the rich cellos and potent horns of the CSO to the fore. The conductor leapt (literally) into the rollocking main theme, drawing precise, almost Bach-like harmonies underneath the swaggering main subject. The bold, brassy performance drew unexpected early applause from a few concert-goers, who were either overcome by the piece or simply didn't know better. The Philharmonic's new Artist-in-Residence plays Bach and Schoenberg. 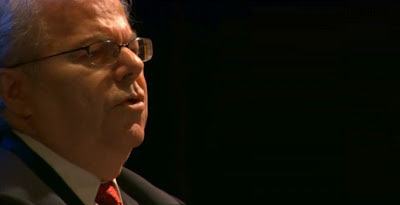 Emanuel Ax. Photo from medici.tv. Thursday night at the New York Philharmonic marked two milestones for pianist Emanuel Ax. It was the soloist's first concert as the orchestra's newest Artist-in-Residence. It was also the first time that this veteran pianist played the music of Johann Sebastian Bach in front of an audience. 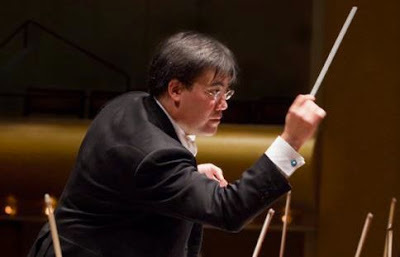 Music director Alan Gilbert conducted. The program opened with Bach's Keyboard Concerto in D minor. Mr. Ax is an adept, fluid artist. But in the opening of the Allegro his playing gave the feeling that he was also finding his comfort zone in this piece. The performance began to jell with the introduction of a second thematic subject as soloist and conductor began the long game of call-and-response. The central Adagio was more assured. Mr. Ax sounded more assured in these slow passages, playing the cadenzas with a light, controlled touch that allowed the notes to flow smoothly together. The finale, with its distinctive, descending theme featured tight interplay between Mr. Ax and Mr. Gilbert. Orchestra and piano chased each other through the descending theme, finally ending the chase on a harmonious cadence. The Chicago Symphony Orchestra opens Carnegie Hall with Carmina Burana. 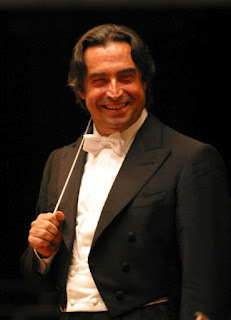 Your host for Wheel of Fortune: Chicago Symphony Orchestra music director Riccardo Muti. The Chicago Symphony Orchestra opened both the 2012-2013 Carnegie Hall season and and a three-night stand at the famous New York concert venue on Wednesday, Oct. 3. The choice of repertory: Carl Orff's epic 20th century choral work Carmina Burana, under the baton of music director Riccardo Muti. Orff's blend of choral drinking songs, pseudo-medieval dances and operatic arias has remained popular since the work's 1938 premiere. However, due to the pop-culture omnipresence of the chorus O Fortuna that opens and closes this hour-long piece, Carmina Burana (the title means "Songs of Bavaria") has something of a mixed reputation. The piece continues to draw scorn from critics and cognoscenti for its catchy melodies, simple structures and a conspicuous lack of thematic development in each of its twenty-five sections. Those perceived weaknesses became strengths under Mr. Muti's direction. The fiery Italian seemed almost sedate during the opening O Fortuna, barely lifting his arms to direct the choristers as the musicans pounded out the familiar ostinato rhythm. But as the cycle continued, Mr. Muti used his experience in opera and symphonic repertory to carve these granite-like blocks of sound into sharp reliefs showing the details of Orff's medieval world. City Opera to junk its past productions. Classic New York City Opera productions may soon be seen on Staten Island. 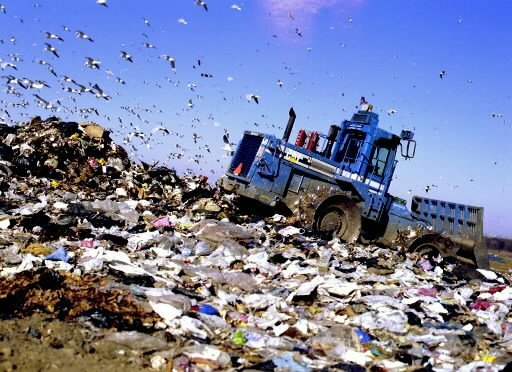 Photo of the Fresh Kills Landfill from brainz.org. In April of this year, at the New York City Opera's annual press conference to announce its 2013 spring season, opera journalist Bruce-Michael Gelbert asked company general manager George Steel about the fate of the company's most beloved productions from its past. Specifically, Mr. Gelbert was asking about The Cunning Little Vixen last seen at the City Opera's old home, the New York State Theater, in the 1990s. I can't remember the exact wording used (it was six months ago) but Mr. Steel said something to the effect that it was unlikely that the Vixen would be revived. Today, a story by Dan Wakin in The New York Times revealed that the City Opera planned to junk not just its old productions, but more recent ones as well. Daniil Trifonov makes his New York Philharmonic debut. Piano whiz: soloist Daniil Trifonov in action. The New York Philharmonic opened its second subscription weekend of the 2012 season on Friday, Sept. 28 with a matinee concert featurig a triptych of Russian classics under the baton of Alan Gilbert. The concert opened with a potent account of Mussorgsky's Night on Bald Mountain, presented here in its revised orchestration by the composer's friend Nikolai Rimsky-Korsakov. Mr. Gilbert made full use of the wide orchestral palette, from the menacing, demonic growls of the contrabass tuba to the warm, soothing melodies played by principal flautist Michael Langevin in the work's closing pages. 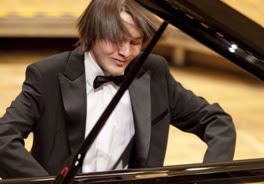 In addition to showing the Philharmonic music director's podium prowess, the performance also makred the orchestra debut of 21-year old Russian pianist Daniil Trifonov. This concert marked Mr. Trifonov's second New York appearance, following a performance of the Tchaikovsky First last season with the Mariinsky Orchestra at Carnegie Hall. For this concert, Mr. Trifonov played Prokofiev's Third Piano Concerto, a work that presents serious technical challenges but also has many opportuntiies for keyboard wizardry. Prokofiev was one of the great touring composer-pianists, and the work was written to provide thrills to his audiences in 1921. The monthly Superconductor guide to classical happenings. October is a time for Halloween and horrified looks from our favorite family. 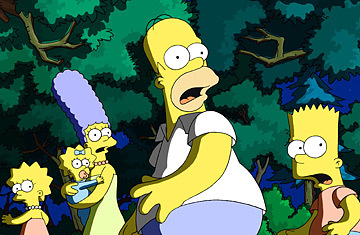 Image from The Simpsons Movie © 2008 20th Century Fox. October is upon us, and concert venues across New York are throwing open their doors to eager throngs of listeners. Carnegie Hall opens. The Philharmonic and Metropolitan Opera are in full swing, and the city resounds as leaves get ready to turn brown. Oct. 9: Otello with Renée Fleming and Johan Botha. Oct. 23: Thomas Adès' The Tempest with Simon Keenlyside. A new production by Robert Lepage. Oct. 27: Le Nozze di Figaro with Ildar Abdrazakov in the title role.